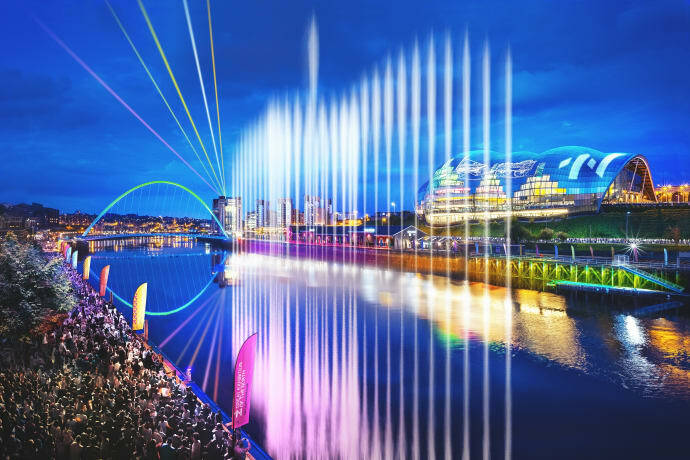 Billed as the UK’s biggest cultural extravaganza of 2018, The Great Exhibition of the North has opened with a stunning water display on the banks of the Newcastle-Gateshead Quayside. The Great Exhibition tells the story of how the North’s innovators, businesses, artists and designers have shaped our present, and how they are inspiring our future. It has been organised by the Newcastle-Gateshead Initiative (NGI), and will run until 9 September. It’s expected to attract more than three million people to the north east of England. Three Trails – Get Design, Get Art, and Get Innovation – will take visitors on a spectacular journey through the Newcastle and Gateshead regions. Each one starts at an iconic venue; the Great North Museum, BALTIC Centre for Contemporary Art and the Sage Gateshead. The trails are interconnected and take in 30 world-class venues and public spaces on both sides of the River Tyne. Each Trail is designed to celebrate the North’s achievements in art and culture, design and innovation. All are packed with events, exhibitions and activities, and will end in spectacular style with the annual Great North Run. Special events include a week of gigs curated by Sunderland-born DJ and presenter Lauren Laverne, opera, a video gaming interactive exhibition, Stephenson’s Rocket locomotive on display in Newcastle’s Discovery Museum, a live recreation of classic north-east set gangster movie Get Carter and several workshops and diversity events. The Great Exhibition is free, but with demand expected to be high, visitors are advised to book events in advance. The opening event featured the UK’s largest water sculpture and display, a brand new film about the North, performances by Leeds band Kaiser Chiefs and a live presentation by Lemn Sissay of his newly-created anthem for the North. The Great Exhibition of the North is expected to bring in an estimated £184m to the region, proving that cultural investment has a financial benefit as well as inspiration for the local community.